The Ministry of Internal Affairs and Communications announced on 10 April (in Japanese) that all the four applicants have been awarded radio frequencies and licences to rollout 5G services. Each licensee is awarded 400MHz spectrum on the 28GHz frequency, while three of them are awarded 200MHz on 3.7GHz except Rakuten, which has requested 100MHz. All the operators are going to roll out 5G services starting in 2020. NTT DoCoMo, KDDI and Softbank will launch the service in spring time, with Rakuten planning to open its service in June. The total investment planned by the operators to the end of 2024 amounted to Yen 1.6 trillion ($14.4 billion). While both NTT DoCoMo and KDDI have pledged to cover over 90% of the country within five years, Softbank only plans to cover 64% of the country and Rakuten 56%. The minimum requirement from the government is serving every prefecture within two years, and at least 50% of the whole country within five years, calculated by the number of geographical blocks the networks will cover out of the total 4,500 blocks the Ministry divides the country into. In addition to coverage requirement, the Ministry has also attached a dozen granting conditions (pp.16-17 of the summary, in Japanese), including commitments to expand optical fibre networks (#2), to improve safety measures to minimise outage during natural disasters (#3), to prevent interference of existing radio licensees (#7) etc. The item that may raise eyebrows is Item 4 on the list, which requires the operators to “take appropriate cyber security measures including measures to respond to supply chain risks” (unofficial translation). It refers to earlier regulations including the “”Information and telecommunications network safety and reliability standards” published by the Ministry of Post and Telecommunications in 1987, “Common Standards Group for Information Security Measures for Government Agencies and Related Agencies” issued by the National Information Security Center (NISC) in 2018, and the cross-departmental “Agreement on IT procurement policy and procedures for goods and services” published on 10 December 2018. The last two documents, though neither of them names any particular countries or brands to be excluded, have been broadly recognised as the Japanese government’s decision to ban companies like Huawei and ZTE from public sector procurements. By invoking these regulations, it may not be too much of a stretch to read it as a message to the operators to stop using equipment supplied by the Chinese vendors. This may not cause serious disruptions to the operators’ business though, as Softbank, the only operator that has Huawei equipment on its network, is already planning to swap for Ericsson and Nokia, Nikkei reported earlier. The European Commission has given its nod of approval for data protection rules drawn up in Japan, effectively extending GDPR protections for European citizens to the Asian country. On top of the current data protection regulations in Japan, an additional set of rules have been created adding safeguards to guarantee that data transferred from the EU will be subject to the same protection as European standards. The supplementary rules will be binding on Japanese companies importing data from the EU and enforceable by the Japanese regulator and courts. “This adequacy decision creates the world’s largest area of safe data flows,” said Věra Jourová, Commissioner for Justice, Consumers and Gender Equality. Starting with the rules, new conditions will be set into play regarding the protection of data, the rights of European citizens to request further information on usage, as well as further requirements dictating what data can be transferred out of Japan to other nations. Protections have also been put in place with regard to how intelligence and law enforcement agencies can use or retain data, while a complaint-handling mechanism has also been introduced. With these new rules the road to Tokyo is now open, allowing data to freely transfer between Japan and all members of the European Economic Area (EEA), Iceland, Liechtenstein and Norway. It’s a win for the bureaucrats which have been looking to develop deeper relationships, creating a trading bloc which can provide more competition for the likes of the US and China. “This is the first time that such a recognition takes place under the GDPR and in a reciprocal manner. As of today, Japan has adopted an equivalent decision for data transferred to the EEA,” said Tanguy Van Overstraeten, TMT Partner and Global Head of Data Protection at law firm Linklaters. For Japan enthusiasts, this announcement will come as great news, especially ahead of the EU-Japan trade agreement which is set to come into force next month. This tie up will create an open trading zone covering 635 million people and almost one third of the world’s total GDP, and the first ever bilateral framework agreement between the two parties. As part of the new relationship the vast majority of the €1 billion of duties paid annually by EU companies exporting to Japan will be removed, as well as regulatory barriers inhibiting some trade, for example on car exports. The European Commission might have its critics throughout the world, but this doesn’t look like anything aside from a good bit of business. Huawei and ZTE have been dealt another blow ahead of the 5G bonanza as Japan’s four operators join the government in snubbing Chinese communications equipment. According to Nikkei Asia Review, the Japan’s telcos have followed the lead of the government by omitting Chinese technology from any future network plans. With Japan set to be one of the leading lights in the 5G era, this is one of the most significant dents in the Huawei and ZTE egos to date. Softbank, NTT Docomo and KDDI have all said they will not use Chinese equipment in their 5G networks, while Rakuten (which will become the fourth operator upon launch next year) has also joined the snub. Yesterday (Monday 10), the Japanese government officially confirmed rumours that it would effectively be banning any public-sector body or organization from purchasing personal computers, servers and telecommunications equipment from Chinese companies. While the guidelines have not named any company specifically, it does add to the growing momentum building against Huawei and ZTE around the world. The official line from the government is the precautions have been put in place to prevent the leak of sensitive information. As is the case most of the time, the telcos generally follow the lead of the national government. This is not necessarily because they agree with the party line, but more to ensure there are no compliance issues in the future when bidding for government work. If the government has banned Chinese components in their own networks for security reasons, it might not look favourable on potential vendors who have the kit in theirs. For Huawei, this could be seen as a massive loss. Over the last 12-18 months, the firm has been buddying up to Softbank, Japan’s main telco, through a number of 5G trials and joint research projects. The stage had been set for a major customer win, following from a profitable relationship in the 4G era, though this seems to be the end of the Japanese road. Looking at the international market for Huawei and ZTE, prospects are starting to look thinner every week. The US was the first to ban the pair, though this is not necessarily new, but with Australia and New Zealand joining the US momentum gathered. South Korean telcos all omitted both Huawei and ZTE from preferred supplier lists, while the UK is also turning as well. Last week, EE said it was stripping all Huawei kit out of its network, and none of the four MNOs will be using any Chinese kit in the core network for 5G. An analogy we have used before is a line of dominos. ‘Western’ governments all tend to follow suit when it comes to regulation and legislation, so it would not be a surprise to see the trends gather momentum. Last week also saw European Commissioner for Digital Single Market Andrus Ansip publicly denounce China on the whole, suggesting the bloc might be jumping on the very same banned-wagon. This of course might be nothing more than posturing, but the signs are ominous. The Wall Street Journal has reported Apple is subsidising operators in Japan to offer discounts on its phones because they’re not shifting as quickly as it would like. After claiming that the new iPhone models are moving slower than planned through its supplier and manufacturer checks, WSJ reported again that Apple is going to offer discount to its XR model in Japan, which is said to be falling short of plan the most. Due to channel price protection, it needs to compensate the mobile operators to do so. The fact that XR, the cheapest of the three new iPhone models, was the worst performer may come as a surprise, though it is to do with Apple’s positioning. One could only speculate that those going for the premium would rather buy the more expensive models (the XS and XS Max). While those who are not after the newest would go for the older models. Since last year’s premium model the iPhone X was stopped when the new models were launched in September, to avoid cannibalisation of the new XR, some consumers went back to the older models, the iPhone 8 series. The WSJ reported that Apple may resume the X both to move consumers to more premium (therefore higher margin) model and to fulfil its OLED display commitment to Samsung. The X is said to be cheaper to make than the XS and XS Max, said the WSJ. Japan was one of the harder to crack markets for Apple when the iPhone was first launched. The country was dominated by DoCoMo’s internet-enabled iMode phones. It took Apple a couple of years before it could convince the Japanese users of the advantage of smartphones and app stores. It looks that Apple is once again having a difficult ride in Japan again. Tech conglomerate SoftBank wants to raise a few trillion yen by offering some of its Japanese operator up for public consumption. Around a third of SoftBank Japan’s shares will be served up in an initial public offering that is expected to raise around 2.4 trillion yen (21 billion bucks). If things go really well it could even challenge Alibaba for the biggest ever IPO, which would come in handy for a group that is especially exuberant in its spending. “Through the listing of SB shares, SBG expects that the respective roles and valuations of the two companies will be clear,” said the announcement. “SBG is accelerating investments on a global scale, while SB is a core company to the Group’s telecommunications business. It is hoped that each of the two companies will be able to provide information regarding their businesses to the market with greater clarity and thereby better respond to the various needs of investors. An alternative way of looking at it is that SoftBank Group is a bit short of cash and has decided that a sport of equity release from one of its subsidiary companies is the best way to get hold of the kind of cash it needs. As well as big acquisitions such as ARM, the group seems more concerned with general tech investment these days. This IPO seems to have been on the cards for a while, but it remains to be seen how much, if any, of the cash raised will be reinvested in SoftBank’s, Japanese network. Hot on the heels of the Australia ban it is now being reported that Japan is thinking of taking similar action. This definitely needs to be filed under ‘unsubstantiated rumour’ at this stage, but is also far from inconceivable, given the current momentum acting against Chinese kit vendors. GB Times reported in English about a Japanese language story alleging the Japanese government is thinking of blocking Huawei and ZTE from bidding on public contracts for building information systems. Last week Australia decided the risk of the Chinese state exploiting the presence of kit from Chinese vendors in telecoms networks to get up to no good was too great and decided to err on the side of caution. There has been no hard evidence published that this happens, and Huawei thinks it has become a scapegoat in a growing economic and political battle between China and the West, but Western governments are increasingly opting to shoot first and ask questions later. Chinese state-run media has apparently questioned the validity of the report, apparently blissfully unaware how imperative it is to question the validity of anything published by state run media. Having said that it could well be nothing, but it seems very likely that other countries allied to the US will seriously consider a similar move. Infographic: Who do Telecoms.com readers think is winning the 5G race? 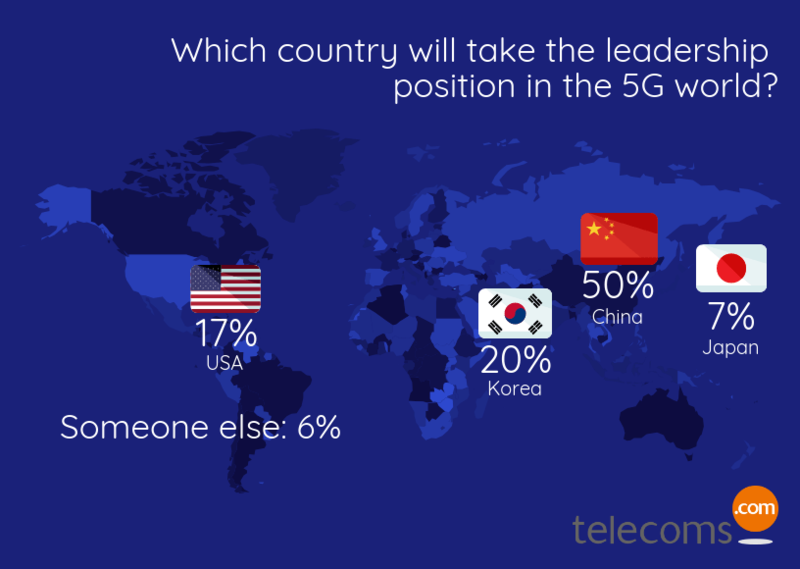 Last week, research from Deloitte placed China at the front of the pack in the race for the 5G dream, so we asked Telecoms.com readers in a snap poll who they thought was winning. Deloitte’s reasoning was built on the progress of network densification programmes across the country, its throwing sites up all over the place, and also future investment allocations. It seems Telecoms.com readers agree with the consultancy as well. We suspect the ‘someone else’ option was directed at a European nation, though considering only 6% decided to select this one, it is not looking good for the continent. Softbank and Yahoo Japan have announced the formation of a new joint venture, PayPay, to launch a QR-based smartphone payment services in Japan by November. The joint venture will lean on the experience of Paytm, India’s largest digital payment brand and a SoftBank Vision Fund portfolio company, for technology and expertise in mobile payments in the latest efforts to move Japan away from a cash-based society. As it stands, less than 20% of payments across the country are cashless, one of the lowest worldwide for a ‘developed’ economy. With the experience of Paytm, the brand has 300 million customers and 8 million merchants, combined with the presence of SoftBank and Yahoo Japan, the PayPay business certainly has a promising to start to disruption. The Yahoo! Wallet which has approximately 40 million accounts, will act as the foundation, with Softbank leading the sales strategy, while also developing a localised service leveraging Paytm’s technology. Once the new service has been launched, Yahoo Wallet will cease to exist, though a time-frame has not been laid out. While the adoption of this technology is far from given, the venture does demonstrate the power of the Softbank ecosystem. While it might have looked like a side-project to keep billionaire CEO Masayoshi Son busy, the Softbank Vision Fund offers a wealth of technology expertise for family members to lean on and launch new services. Of course, Vision Fund employees will be looking to find investments which will make money in the long-run, but complementary businesses and technology to aid the progression of current new services would certainly play some role in the decision making. Japanese operator NTT Docomo bought some baseband gear from Nokia. That’s it – nothing else happened – sorry. It was great gear though, with all the bells and whistles like antenna and flashing LEDs and that. In fact, as far as baseband gear goes, it wouldn’t be an overstatement to call it legendary. KDDI and Softbank are going to be sooo jealous when NTT installs these paragons of shininess. They’re going to want to just chuck their basebands in the bin. In other news Nokia got some new curtains at its HQ that really brighten up the place and it found a great new sushi place in Helsinki. Furthermore Nokia’s new trainers cost loads more than Ericsson’s, it has a PlayStation 4, an Xbox One and a Nintendo Switch with loads of games and steering wheels and stuff, and its dad could totally batter Ericsson’s dad in a fight. In response to a report claiming it’s going to flog $18 billion of shares in its Japanese mobile units. Softbank has said it might, but no decision has been made yet. The report was brought us by Japanese business title Nikkei, which chatted to someone who reckons SoftBank Group aims to list its Japanese mobile phone unit in Tokyo and overseas this year. The un-named source also reckons the amount of money raised by such an IPO is likely to be in the region of two trillion yen, which is about $18 billion. SoftBank is the third of three major Japanese MNOs with around 24% subscriber market share according to Ovum’s WCIS service. Narrowly ahead is KDDI and the market leader is NTT DoCoMo. But SoftBank Group also owns Sprint, ARM and a bunch of other stuff, as well as being hyperactive in the general tech VC space. So it’s perfectly plausible that it might want to raise a few extra yen, but right now nothing has been decided. You can read further analysis on Light Reading here.